Location: Located next to the Aiguille du Midi lift, just 5 minutes' walk to the centre of Chamonix. The Cristal de Jade is an impressive residence with fantastic facilities which opened in December 2016. It offers the ultimate in luxury and relaxation for those keen to have the flexibility of a self-catered property. The interiors are tastefully furnished and the apartments are spacious and very well equipped. Relax in the fabulous spa area, with its large indoor swimming pool. Located next to the Aiguille du Midi lift for easy access to the Vallée Blanche and for a closer view of the breathtaking Mont Blanc. The bus stop outside takes you easily to the various ski areas and the resort centre is just a short walk away, meaning dining out is very easy and the shops and resort activities are only a stone's throw away. A great accommodation for families with the children's play area, children's pool and in the centre of resort for a host of easily accessible activities. Baby kit available including cot, highchair, changing mat, baby bath, push chair and baby listener are on request. Babysitting is also available. All payable locally. Large indoor swimming pool and children's pool, spa with sauna, steam room, whirlpool and fitness room, massages and beauty treatments are also available (pay locally), reception/lounge area with fireplace, children's play area (unsupervised), grocery and bakery delivery, ski room with boot dryers, washing and drying machines (pay locally), lift to all floors. Sunday to Friday 8am to 12pm and from 3pm to 8pm. Saturday 8am to 10pm. Subject to change. Tourist Tax 18yrs +, Refundable deposit €500. The apartments are all at the height of luxury, with tasteful furnishings and well-equipped kitchens (including wine fridge, espresso machine, coffee maker, kettle, toaster, induction hob, fridge/freezer and dishwasher), with a balcony. Bathrooms have a bath with shower head. 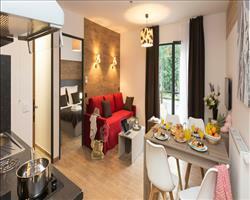 The two room apartment (A4) sleeps up to four people and has one twin bedroom and a sofa bed in the lounge area. The three room apartment (B6) has an additional double bedroom and shower room. The four room apartment (C8) has one double bedroom, two twin bedrooms and a sofa bed in the lounge, plus one bathroom and one shower room. There is a large flat-screen TV in the lounge area and master bedroom with English channels, telephone, hair dryer, bathrobes and Pure Altitude toiletries. Some apartments are accessible for disabled customers, please contact us for details. We update Cristal de Jade Residence's details often, but facilities do change. e.g. some extras listed by the supplier as "free" or included might only be for the first time you use them, or for one time per party, then charged for further use. If any specific feature is essential to your holiday, make sure you ask us to confirm the details of it before you book your holiday. This package holiday to Cristal de Jade Residence in Chamonix, France departs Saturday 21st March 2020, for a 7 night stay on a "self catering" board basis. A local tourist tax (Taxe de Sejour or Kurtaxe) is levied by many councils in European ski resorts. It varies by standard and type of accommodation and is age dependent, so not everyone is charged. It's not included in the basic price of your holiday and is usually paid locally. For reference, the average charged in winter 15/16 was between 50p and £2 per person, per night. (adult 6 day). Ask for a quote when booking Cristal de Jade Residence. Chamonix has N, S, E, W facing slopes. Usually open for skiing December - May. Residence Isatis Chamonix France, Dover Ferry 21st March. Hameau de la Pier... Chamonix France, Dover Ferry 21st March.